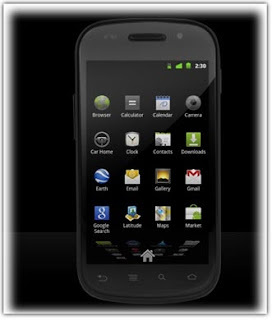 Google co-developed with Samsung in bring out Nexus S Smartphone, the first device to run Android 2.3, codenamed "Gingerbread", new flagship Android phone - ensuring tight integration of hardware and software to highlight the latest advancements of the Android platform. As part of the Nexus brand, Nexus S delivers what we call a “pure Google” experience: unlocked, unfiltered access to the best Google mobile services and the latest and greatest Android releases and updates. "The platform now supports extra large screen sizes, such as those that might be found on tablet devices,"
But there's no information about a tablet channel in the Android Market, or any Android Market support for tablet devices that don't include phones. That may have to wait for the next release, codenamed "Honeycomb"
Gingerbread will also be available on other devices, and Google said it will roll out to Nexus One phones "in the coming weeks." It may be months until other users see Gingerbread, though, as most upgrades get filtered through manufacturers and carriers. The Nexus One, which Google sold directly to consumers, was plagued by weak sales and customer complaints. But Google’s sustained interest may be a sign that the company is still trying to broaden the appeal of Android’s technology and ensure its competitiveness with rivals like Apple, Microsoft and Research in Motion. Perhaps in an effort to learn from past mistakes, Google is taking a slightly different strategy with the Nexus S. Instead of attempting to sell the device directly to consumers, and deal with having to provide customer support for the devices, the company teamed up with Best Buy to sell the new phone in both its physical and online stores.